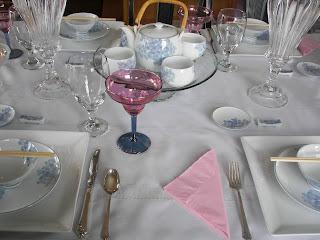 I am joining Susan at Between Naps at the Porch for Tablescape Thursday. 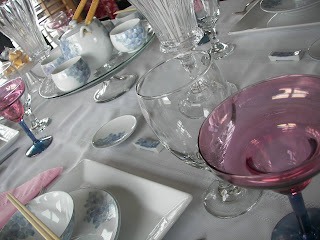 Check it out; you will find amazing tablescapes. I am also joining with Beverly at How Sweet the Sound at Pink Saturday. For your pinkies; the dishes do have pink in them, but are not showing up with my photography...sigh. Note: Do not fail to view the "Peking Duck" that I have procured for this feast; it can be viewed below. Back in the 1980's I began a love affair with Chinese food. I was in college then and one of my sisters and two brothers lived in the same town. We had many Chinese feasts together...many happy times! My sister Jackie is a fast cook; being a fast cook is a huge advantage when cooking Chinese food. 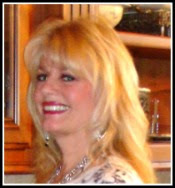 My husband says I am like a little tornado when cooking...I am fast, but wow what a mess I leave behind! 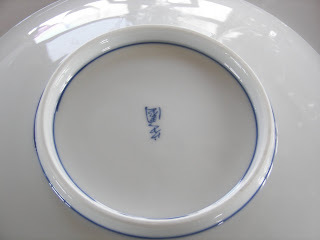 No, it is NOT made by Noritake, but I do think it was made in Japan, not China..not that I CAN read Japanese or Chinese characters...and not that I even know if I have the characters going in the right direction! Can anyone enlighten me on this? You could also put the rice bowl in the left hand corner. I like the rice bowl on top of the plates in the middle. 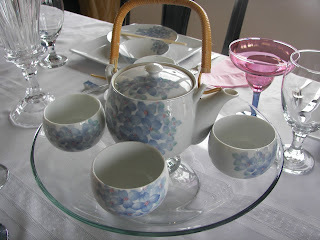 The teapot and cups are very sweet. Don't you love the little sauce plates and chopstick rests? If you are a purist, you will note that I have made a huge faux pas....I have included a knife! You should not include a knife in Chinese placesettings. But as for me, I have included the knife! 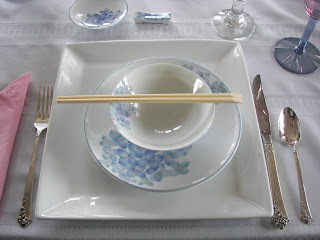 Oh well, I am sure I haven't set the chopstick rest or rice bowl or plate or sauce plate in the right place either! 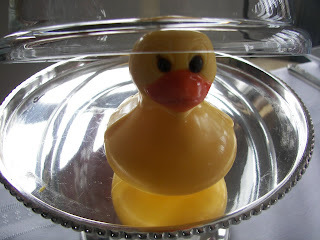 As for the menu, we will be having the famous Chinese dish "Peeking Duck," you see he is peeking out of his dome! (Tee-Hee) He is edible and so cute; he is made out of chocolate. 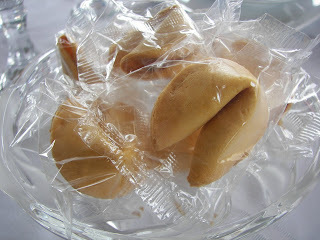 Of course, we won't forget the fortune cookies. I HAVE been known to believe in them. My roommates in college, back in the 1980's bought me a four-piece place setting of this china; I bought another four-piece place setting and the teaset. 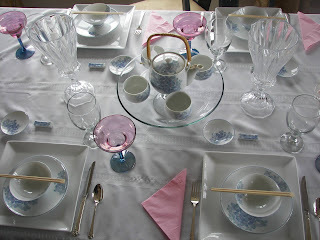 Chinese dinnerware set --- La Belle's back in 1980's -- A kind of funky warehouse where you would order what you wanted and they would send your order down conveyor belts. 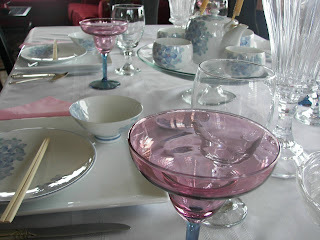 Pink and Blue Margarita Glasses --- Maybe Cost Plus...many years ago. That is so beautiful! I love the delicate blue and flowers..just wonderful..
Love this! Makes me think of Japan, where the food would pass by your table on a conveyor belt and you just get off what you want. Anyway, love that china. 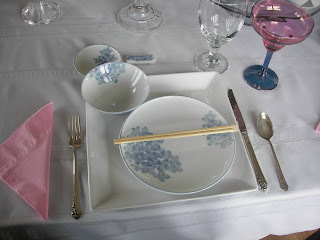 I tend to make up my own rules when doing my Asian "inspired" tables since I have not in any way mastered chopsticks! Beautiful table!! Great pics! Luv the Duck it looks so delicious! Really cute! So lovely, love the duck! This is so delicate and springlike--absolutely beautiful, Joni! What a lovely table, but that duck just too cute to eat.... 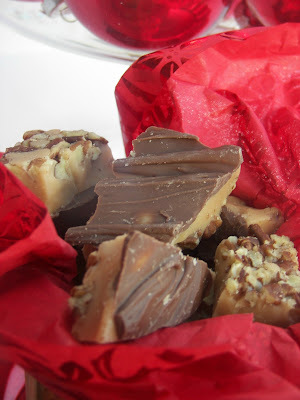 Although, chocolate is so tempting. Oh, very beautiful! I love the delicate blue and white pattern~ Looks like we both had the same idea with our cake pedastal and tea-cup on top! So glad you came by too. My son lives in Phoenix now and he misses the grass too! So serene, light & airy feeling. Love the "Peeking" duck. Very clever. Love your fun peking or is that peeking duck table! Very pretty and so different from my red and black Asian dishes. I love the duck...my favorite thing...the margarita glasses, love the colors. Oh! reminds me of my life when I was young in the Philippines. Lovely Joni. You are a sweet one Asian--- kinda? Thumbs UP for your TS. Hi Joni, Thanks for stopping by. 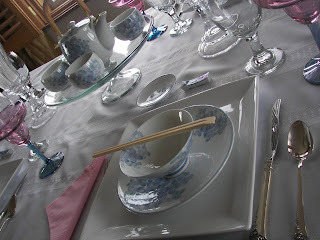 Great to see your soft blue and white Chinese table setting - love the accents of the pink and the duck is a hoot! I really love this table! Gosh that is a lovely tablescape, so pretty and fresh in that colour scheme. Like the many little details to admire in your creation. Lovely ! I like this! I love the freshness, elegance, and subtlety of this table. Beautifully done! Very nice - Happy Pink Saturday! It's all so very,very pretty. I love the delicate look of your beautiful pieces..and I love the duck..:). Happy Pinks.. I forgot about LaBelle's. It's funny to think about those types of stores now. They really went out of style quickly.